TALLY CHAMPS 2 VOLUME Indepth & Advance COURSE is developed after a thorough research & study of the industry. By joining this course student will be able to determine where he needs to focus & career prospects available for him in the field of Business Accountancy. After completion of the course you get the Original online TALLY Certification, along with the Tally operations certificate and GST Certificate. A good course for Beginners and students from any background. Teaches you Tally operations & Champ. The most in demand and popular Tally course for all students and professionals, All the Tally operations & Advance Tally techniques. Finanacial Functions, Pivot Tables, HLOOKUP, VLOOKUP, Goal Seek, Charts Graphs, Character Funtions..etc. Features of the database in an office environment with maximum efficiency. Learn how to use Ms-Office: Ms-Word, Ms-Excel, Ms-Powerpoint for Office Automation with LIVE PROJETS. This Course is a must for ALL ! Over 25 projects to work on. Get 100% hands on practical training. Get Certified from Tally. Get validated on Advance Tally techniques. The whole course was a really good experience! Very helpful to gain easy access to the laptop over a short period of time. Clear and to the point explanation. Real good work. I have joined Softpro for Advance Excel & Tally Course 4 moths ago. As tally course being goes to much easy in Softpro. Basic concepts of accounts gets clear by teaching faculty time to time. Each students gets special attention. Softpro teaches how to apply accounting rules in tally & how it works in business world. Thanks Softpro. Best wishes to Softpro. I have completed my Excel Macros and Java programming training from SoftPro. The faculty is well versed with the subject and the course is nice. i have done Tally 9 course from Matunga Branch. The teaching is very easy to learn. great experience!!!! I Have Done C Programming From SoftPro,Matunga. It Was Good Experience. i have done my tally basic course at matunga branch. the course was very useful. completed my tally course in a months time at this institute and it was really easy training. the atmosphere was extremely cordial and the teaching method was very simple. i would definitely recommend all commerce students especially to do the course from here if you really want to learn tally and brush up on your accounts. I have done my Tally Course basic and executive from Softpro institute. The professors and staff are very cooperative, patient and understanding towards students. they give attention on detail. i am very pleased with the result. i have done my tally training course form the Matunga branch. i found the course very interesting and fun , i also feel that a little bit of homework should also be given for practice. i have done my tally course from martuga branch I came to know about softpro from internet.I found the training good. i completed my TALLY coure through this faculty...the professors are highly trained and of great experience...i am glad that i got an opportunity to complete my course from this institution. The experience was great enjoyed studying here and i also look forward to COMPLETE many more courses!!!! i have done my basic tally training from softpro, matunga west, that is my best experienc, i like to thank my teacher. and thats all thank you. I had finished my Tally baisc from Softpro Matunga branch and had understood all the basic requrements to know Tally as accounting software. Course : Tally (Basic) & Tally (Advanced) from Softpro Computer Education. 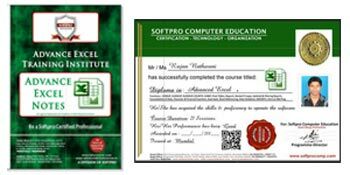 I'm on the verge of completing these courses from Softpro (Matunga), this institute is one of the best institute located in Mumbai & has best faculties from which you can learn new things. The faculty from whom i did this course is one of the best human beings I've come across in my life, the teachings & methods used to learn this course is very user friendly. I want to thank Softpro for assisting & helping me learn this course which will further help me to shape my career.. Thank you ! I have done my Tally Training from Matunga Br. It was a good experience learning at this particular institute. The Material provided is helpful and in proper language. Good practical learning, flexible timings. 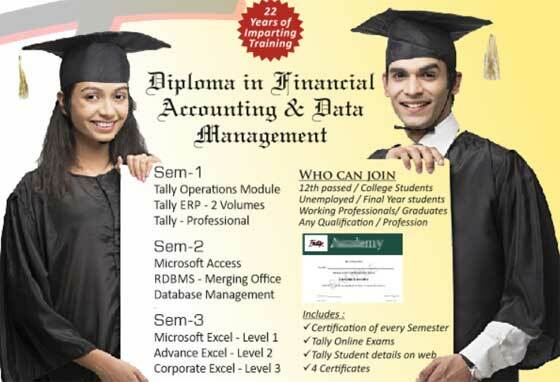 Trainer Sushil Mohan has an excellent knowledge about tally and teaches well. I would highly recommend this institute for anyone. i have completed my tally erp 9 course from sofrtpro matunga branch,it was nice experience here,f facalty trainging is very good.they clear our doubts very poilitely.everyone here is cooperative n helpful. I completed my tally basic and tally champ course from softpro computer education (matunga). Sir helped in solving many doubts. The staff is good and helpful. I completed my tally basic course from tally training softpro(Matunga)..It was a good experience..very helpful...the faculty who taught me has been really helpful and helped me to solve all my doubts...must visit...Thankyou softpro for helping me to learn! i have done my tally basic from soft pro matunga branch, and i am very delighted to do it from such an institute, the staff here are very informative and very patient thus helping learn in a very good manner. thanks a lot!! 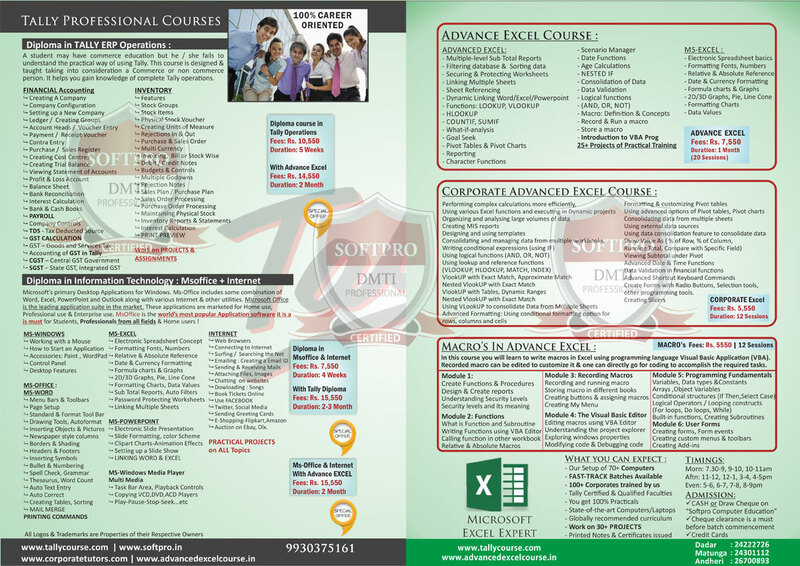 I have done basic tally and advance excel course from andheri branch. Professor their teach you as per your speed and solve your's every doubt. It is good place to learn. I learn various thing while learning Tally. All the professor completing their on time. if you miss any lecture then also they adjust with their time. All professor are well knowledgable in their teaching. I thing you must visit this place for your tally course. they are providing various course. Teaching is nice. But dont forget to ask doubts because if you dont, you wont get to learn more. It was a great learning experience and I benefitted from the course, as I was able to use my learning in my training at a C.A. firm where I was initially assigned the job of data entry in Tally. I am now confident to take up any job that I will be assigned in future. I have completed my Tally ( Basic and Advance) from Softpro Matunga Branch. This course helped to improve my knowledge of Tally. Faculties and another members are very good and helpful. They give us full time to learn the course and clear are doubts. Thank you Softpro for this wonderful training. Address: B/2,Vimal Udyog Bhavan, 1st Flr, Near Mahalaxmi Society, Opp. STARCITY Cinema, 5 Min Walk from Matunga (West) Station, 10 Min from Dadar West Station (Come from the Dadar Phool Market towards Ruparel College), Mumbai- 400016. Teaches you Tally operations & Champ. 6 Volumes of Books, 6 online exams. Learn to write macros in excel using programming.